Port and route support. The user can insert many different ports and routes for the precise calculation of voyage miles. For each intermediate port the user can select the route e.g. via Suez and the distance estimation changes accordingly. Automatic distance calculation The distance calculations can be either manual or via the use of BP tables at a small extra cost. Automatic days calculation. Using distance and speed information the system calculates the number of days required for the voyage. There is the possibility of changing the speed or applying a speed curve for additional accuracy. Ports and delays. The application can handle port and other delays and re-calculates the estimate via demurrage. Fuel Consumption. ΥIFO & MDO calculations can be handled with variable prices and using vessel data for fuel consumption estimates. Bunkers are also supported. World Scale Calculations, World Scale. The user can make an estimate for three different world scale calculations of lump-sum values in the same sheet in order to find the best offer. Version Control. The application keeps different versions of estimates and can find similar estimates for comparison. Estimate Printouts. The application provides several reports and supports estimate export to Excel. Real values. 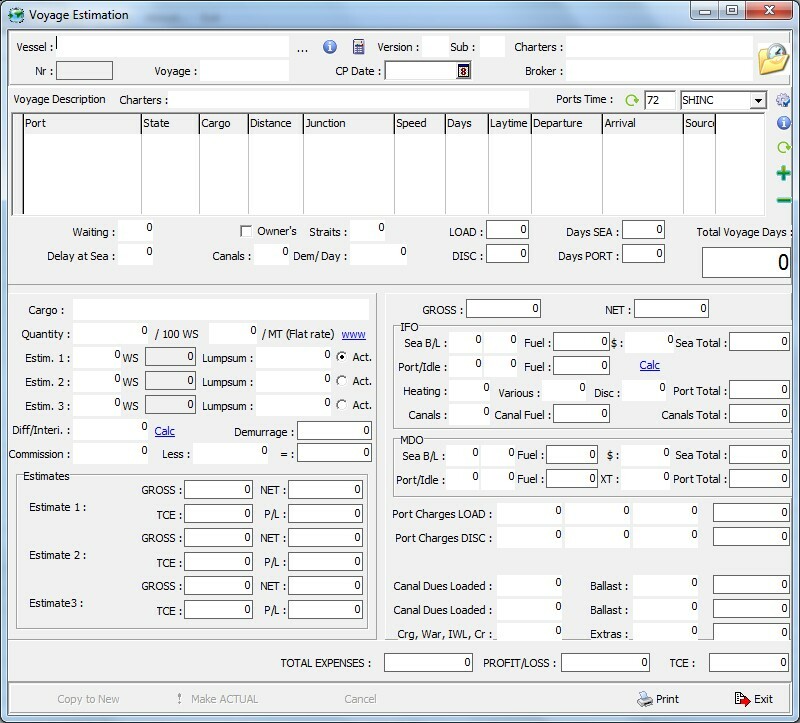 After the completion of a voyage the user can insert the real values of the voyage and produce a report for comparison. Please note that in the ship’s records more detailed data are kept covering also various technical specs. The application is developed in Delphi 2005 Professional and it can be fully customized to address all your individual requirements. The databases currently used are either MySQL or Microsoft SQL Server. Other databases can be used if deemed necessary.